Online general admission tickets include a 10 percent discount. Remember that you can apply your general admission ticket purchase towards a membership to save even more. Membership includes free admission to the Museum year round, as well as discounted prices for special events and programs, including summer camps. General Admission tickets are valid up to one year of date purchased. Web tickets are not transferable and not redeemable for cash. Today's date will appear on the ticket as a reference to the date of purchase. You can apply this admission towards a museum membership within 30 days. 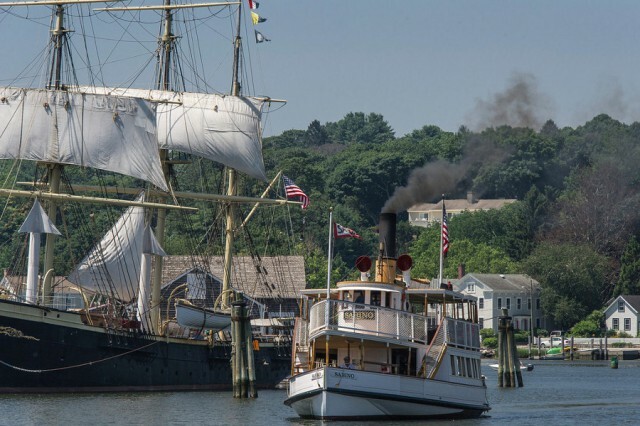 Please check Mystic Seaport's Plan Your Visit page for Museum hours of operation during your visit. Please note these General Admission tickets are valid daily. For general admission information, please call 860.572.0711 or email info@mysticseaport.org. Have a group of 15 or more? Call 860.572.5331 for group admission tickets. Also visiting Mystic Aquarium? Save with the Mystic Pass. Celebrate America's Maritime History at Mystic Seaport Museum, and enjoy close encounters with our ocean planet at Mystic Aquarium. Two great destinations. One great price. Your pass to the best Mystic has to offer.